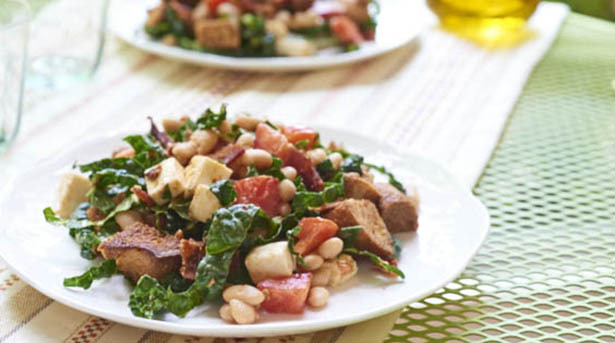 This hearty main-dish salad features kale, tomato, white beans, bread cubes and bacon tossed with balsamic vinaigrette and topped with mozzarella cheese. Combine kale, tomato, beans and bacon in a large bowl. In a small bowl, combine oil, lemon juice, vinegar, pepper and paprika; mix well. Add 2 tablespoons of the dressing to kale mixture and stir to combine. Let stand for 15 to 20 minutes. Toss in bread, mozzarella and remaining dressing. Top with mozzarella and serve.